Figure 1. The Vogtle nuclear power plant in Georgia, USA. It operates 2 of the United State's 99 reactors for the production of nuclear power. Nuclear power is the electricity generated through the use of nuclear fission. Nuclear power supplies the world with around 11% of its total electricity, with operation in 30 countries. The USA (33%) and France (17%) are the world's most dominant producers of nuclear power, with other notable producers including Canada, Russia, South Korea, Germany and China. See the data visualization below for more statistics on nuclear power in the world. Nuclear power is achieved by the use of a nuclear reactor in an external combustion engine, where the heat generated by fission produces steam which can spin turbines and run a generator. While there are many types of reactors and different nuclear reactions, the production of steam is common among all nuclear power plants. Seen below in Figure 2 is a typical boiling water reactor power plant. Figure 2. A boiling water nuclear reactor, which is an external combustion engine. As of October 2018, 452 reactors are currently in operation within power plants, with 55 currently in construction. All power plants make use of uranium either on its own or in combination with its by-product plutonium for fuel, as uranium is relatively abundant and cheap. The potential use of thorium in the generation of nuclear power is being researched and in development around the world. Nuclear fuels are taken from the ground and processed (known as enrichment) before being placed into a power plant—just like coal, oil and natural gas. All nuclear fuels in use are heavy atoms with large nuclei at their core, and we take advantage of the energy released when the atom splits. This is called nuclear fission, and is the only method for generating nuclear power today. In the future, nuclear fusion is promising for providing nuclear power, however it currently requires more energy to run than it actually produces. The University of Colorado has graciously allowed us to use the following PhET simulation. 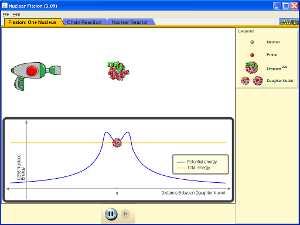 Explore the PhET animation below to see how nuclear fission works, and how reactors produce energy. Uranium fuel is the most popular nuclear fuel. About 99% of the uranium found on Earth is 238U, 0.7% is 235U with trace amounts of 234U. In order to get constant energy from a nuclear reaction, it must be self-sustaining. This occurs in a nuclear chain reaction, where 235U absorbs a lone neutron, undergoes fission by splitting into two smaller atoms, and releasing more neutrons. These extra neutrons can then be absorbed by other 235U atoms, causing the process to continue. Uranium enrichment involves the refinement of the abundant uranium (238U) to a higher percentage of 235U, because it will perform chain reactions more efficiently. This is a very difficult process as the only difference between 238U and 235U atoms is a very small difference in mass (about 1%). To enrich uranium, multiple iterations of gaining a slightly higher concentration of 235U are repeated until the desired ratio is created. The more 235U that is desired, the more energy intensive and costly the process becomes. To learn more, please visit the uranium enrichment page. Fortunately, some nuclear reactors require no enrichment at all, and operate with natural uranium. The most notable of these is the CANDU reactors which use heavy water rather than light water as its moderator, allowing for the use of natural uranium. Most reactors require very little enrichment of uranium. The table below depicts how much enrichment is required to produce a certain grade of uranium. The map below shows which primary energy different countries get the energy to generate their electricity from. Nuclear is seen in green. Click on the region to zoom into a group of countries, then click on the country to see where its electricity comes from. Some notable countries include China, Germany, USA, Russia, Canada, and France. ↑ "PRIS - Reactor status reports - Operational & Long-Term Shutdown - By Type", Pris.iaea.org, 2018. [Online]. Available: https://pris.iaea.org/PRIS/WorldStatistics/OperationalReactorsByType.aspx. [Accessed: 13- Aug- 2018]. ↑ The world encyclopedia. [Oxford]: Oxford University Press, 2008. ↑ M. Allaby, A dictionary of earth sciences. Oxford: Oxford University Press, 2008.